using Fresh produce and ingredients makes all the difference to flavour and the overall quality of your food (I drove you crazy saying this and will keep saying it). Anyone who cooks knows this. You hear it all the time, but it cannot be underestimated, and you can’t hear it enough! There is nothing like the flavour of fresh ingredients. Once ingredients are processed, canned or even frozen, they lose so much of their properties and flavour that they almost become different from the real thing! Once you try food that has been prepared using fresh ingredients you will instantly know what you have been missing on all along. Coconut milk is a perfect example of this fact. 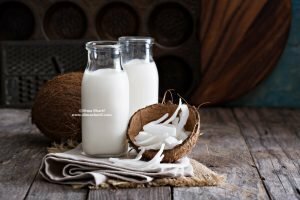 The fresh coconut milk is so delightful and can be used in many food preparations both savoury and sweet. The addition of this milk instantly transforms the flavours of the dish and the experience, taking you on a vacation to faraway and exotic places with its distinctive, tropical flavour. We mostly use canned coconut milk, the carton ones and at times even the powder version of it. But just try a curry made with fresh coconut milk! I am telling you it is different and 100% better. So if you liked the curry made with the canned stuff, you are going to love it made with fresh coconut milk. So how do you get the fresh coconut milk? Well, you have to make it of course! Fresh coconut milk is not hard to extract, in fact it is so easy that you will think: why did I ever go for the canned stuff?! Yes, this is very true, and this post here is dedicated to show you just that. Then if you are interested read on, as I will share with you some coconut cultivation history, simply because history of food is so interesting as it so happens to tell us the story of early people, their voyages, adventures, trade routes as well as the story of colonisations and power shifts… Nothing like food to tell the true story of humankind. The video below is for the old school, traditional method of coconut milk extraction, where it is all done by hand, apart from the grating where a metal device is used. It is a very good example for what will be required to extract some coconut water, milk and coconut shavings should you find yourself stranded on an island! Get a fresh coconut that still has it’s natural water. Don’t worry if you can’t find one with its natural water still there, you can always use drinking water. Drain the coconut water through a sieve into a bowl and set aside. Peel and finely grate the flesh of the coconut and place in a large bowl. Add 2 tbsp coconut water and let it rest for about 2 hours. You will find that it has drained off some of its natural juices at the bottom of the bowl. Strongly rub the shredded coconut releasing the milk out onto the bowl. Grab handfuls of the grated coconut and squeeze all the milk out until no more can be squeezed. Place the dried coconut in separate bowl. Continue to squeeze until all the quantity had finished. Pass the milk through a sieve to get rid of any flesh. And there you have fresh coconut milk. You can either spread the dried coconut flesh on a large tray and place in the sun to dry, to get your home-dried desiccated coconuts, or you can use this flesh in making Coconut Chutney (will post the recipe at a later stage) and you can also use it in making desserts…etc. How much easier can it get?! Simple Natural Fresh Goodness….. Doesn’t get any better! Now let’s see what coconut DNA reveal about human history! Could some of the human history be recorded in the coconut DNA? Kenneth Olsen, a plant evolutionary biologist, set out with some colleagues to examine the DNA of more than 1300 coconuts from all over the world. The team consisted of Bee Gunn, now of the Australian National University in Australia, and Luc Baudouin of the Centre International de Recherches en Agronomie pour le Développement (CIRAD) in Montpellier, France, as well as Olsen, associate professor of biology at Washington University in St. Louis. Their research and finding are described in the June 23 online issue of the journal PLoS ONE. Why did these people decide to carry out DNA testing on coconuts? Before the DNA era, biologists recognized a domesticated plant by its morphology. For instance, where grains are concerned, the most significant trait in domestication is the seeds’ tendency to break off the central grain stalk once mature. But that morphology was harder to translate into a plausible evolutionary history in the case of coconuts (read the details of why not in the original study), which meant that it was hard to study coconut’s accurate evolutionary history, where it originated, it’s types and its movement around the world. Was it the work of nature or was it carried across the oceans to new destinations? So to put those questions to rest once and for all a DNA test was carried out to see whether or not definitive answers were to be found. Evolutionary Biologist Kenneth Olsen, didn’t expect to find much geographical structure to coconut genetics when he first took on the project. “I thought it would be mostly a mish-mash,” he says, “thoroughly homogenized by humans schlepping coconuts with them on their travels”. He was in for a surprise as it turned out that there are two clearly differentiated populations of coconuts, a finding that strongly suggests the coconut was brought under cultivation in two separate locations, one in the Pacific basin and the other in the Indian Ocean basin. What’s more, coconut genetics also preserve a record of prehistoric trade routes and of the colonization of the Americas. The most striking finding of the DNA analysis is that the Pacific and Indian Ocean coconuts are quite distinct genetically. “About a third of the total genetic diversity can be partitioned between two groups that correspond to the Indian Ocean and the Pacific Ocean,” says Olsen. “That’s a very high level of differentiation within a single species and provides pretty conclusive evidence that there were two origins of cultivation of the coconut,” he says. One exception to the general Pacific/Indian Ocean split is the western Indian Ocean, specifically Madagascar and the Comoros Islands, where Gunn had collected. The coconuts there are a genetic mixture of the Indian Ocean type and the Pacific type. Olsen and his colleagues believe the Pacific coconuts were introduced to the Indian Ocean a couple of thousand years ago by ancient Austronesians establishing trade routes connecting Southeast Asia to Madagascar and coastal east Africa. Olsen points out that no genetic admixture is found in the more northerly Seychelles, which fall outside the trade route. He adds that a recent study of rice varieties found in Madagascar shows there is a similar mixing of the japonica and indica rice varieties from Southeast Asia and India. To add to the historical shiver, the descendants of the people who brought the coconuts and rice are still living in Madagascar. The present-day inhabitants of the Madagascar highlands are descendants of the ancient Austronesians, Olsen says. Much later the Indian Ocean coconut was transported to the New World by Europeans. The Portuguese carried coconuts from the Indian Ocean to the West Coast of Africa, Olsen says, and the plantations established there were a source of material that made it into the Caribbean and also to coastal Brazil. So the coconuts that you find today in Florida are largely the Indian ocean type, Olsen says, which is why they tend to have the niu kafa form. On the Pacific side of the New World tropics, however, the coconuts are Pacific Ocean coconuts. Some appear to have been transported there in pre-Columbian times by ancient Austronesians moving east rather than west. During the colonial period, the Spanish brought coconuts to the Pacific coast of Mexico from the Philippines, which was for a time governed on behalf of the King of Spain from Mexico. This is why, Olsen says, you find Pacific type coconuts on the Pacific coast of Central America and Indian type coconuts on the Atlantic coast. Far from being a mish-mash, coconut DNA preserves a record of human cultivation, voyages of exploration, trade and colonization. Such is food, always the most truthful tell tool of the story of humankind. Through it’s origins, movement and settlement we learn about the different people, their movements, life conditions and settlements. Eventually teaching us the collective story of humankind. Who knew produce could store so much memory! ¹ DNA Story Source: Materials provided by Washington University in St. Louis. Original written by Diana Lutz. Note: Content had been edited for style and length. ² Disclaimer: I go on my Culinary Trips on my own behalf, self-funded and do not earn any income or compensation in any form for recommending any accommodation, restaurant, activity…etc. I share my experience with you to hopefully inspire you to try the locations and activities which I have personally found outstanding. The views expressed in this website are my own, unless otherwise indicated. This is fantastic – especially since coconut milk in cans has so much BPA in it. Thanks for sharing this very informative and step-by-step instruction! I am VERY excited for your post on coconut chutney! I'm obsessed with it! Maybe you could tell me what the stuff is that looks like coconut chutney but is orange-tinted or pink-tinted is? I'm guessing it's just flavored with coconut chutney, but with what? Mmmmm, I love me some dosa and coconut chutney!! Dima,the easiest way to do this is to mix the fresh grated coconut and water and blend it.Then strain and press the mixture through the sieve.This is first extraction and called the thick milk.We normally blend it thrice and extract the thin milk too.This will get maximum amount of flavur than squeezing with hands. This is brilliant Farwin 🙂 and sounds like you get every last drop of the flavour. I have to say that I do like the manual extraction though, very rustic and organic lol it did result in a thick milk, which was just Divine! and also added your RSS feeds, so when I have time I will be back to read a lot more, Please do keep up the fantastic work. Happy you found us! Look forward to hear back from you soon, and hopefully you will enjoy browsing. Thank you so much, that is very sweet and makes me happy to know you are enjoying reading my articles. Do check out the recipes and try some, they are fail proof! Thank you, that is sweet. I will keep writing, but you keep coming back and reading too 🙂 don’t forget to let me hear from you when you do! At this moment I am going to do my breakfast, after having my breakfast coming yet again to read more. Wonderful, what a webpage it is! This weblog gives useful information to us, keep it up. Thank you, glad you are enjoying reading and exploring my website. Do drop by again soon, you will find many useful articles and beautiful recipes. I have got much clear idea about extracting coconut and its history from this article. of valuable information, thanks for providing these kinds of valuable information. it and recommend it to my friends. I am confident they’ll benefit from this site. You are so interesting! I do not suppose I’ve ever read through something like this before. So great to find another person with a some genuine thoughts. Seriously.. many thanks for sharing this. This web site is one thing that is needed on the web, someone with originality! There is certainly a lot to know about this. Yes agreed, so much to know through food! It is the mirror of a society and an era! it to a few friends, thanks on your effort! your site daily and always find pleasant and interesting information here. I enjoy reading your posts. What a totally amazing website. You’ve got something special here! Congratulations. I always used to read such pieces of writing in newspapers but now I am happy to find this quality content on the net. I am subscribing to receive more from you, thanks. an expert on this subject. I have subscribed to keep up to date with your posts. Hi! I simply would like to give you a huge thumbs up for your great info you have here on this post. You sure know what you’re talking about. Everyone is going to love visiting your site. and found it really informative. Keep it up, a lot of people will benefit from your writing. I simply can’t get enough of your website, I recommend it to everyone and know I will be back to check out new posts.